DETROIT – Truth Wins Out will be in Detroit, Michigan this weekend monitoring Lou Engle’s The Call prayer rally at Ford Field. The event’s objectionable goals are to convert Muslims to fundamentalist Christianity and to demean LGBT Americans. 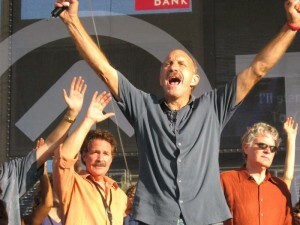 Lou Engle is a notorious anti-LGBT extremist who frequently uses violent imagery in his tirades against homosexuality. In 2010, Engle brought The Call to Uganda, where the legislature was already considering the infamous “Kill the Gays Bill.” His rally stoked the fires of homophobic hatred and helped to create an even more frenzied climate of intolerance in that country. The Detroit rally is intimately connected to Texas Governor Rick Perry’s controversial The Response Houston prayer rally in August. Perry’s rally was organized by the International House of Prayer, an organization that employs Lou Engle, and many of the same religious leaders who spoke in Houston will also speak in Detroit, including Cindy Jacobs, a self-styled prophet who blamed a massive bird die-off in Arkansas earlier this year on the repeal of “Don’t Ask, Don’t Tell.” These leaders are part of a radical movement known as dominionism, which seeks to overthrow secular government in America and install a government of, by, and for conservative Christians in order to help usher in the End Times. Truth Wins Out (TWO) is a nonprofit organization that fights anti-LGBT religious extremism, monitors anti-LGBT organizations, documents their lies and exposes their leaders. TWO specializes in turning information into action by organizing, advocating and fighting for LGBT equality.